For as long as I’ve been a member of the bar, lawyers have been talking about the role of women in the practice of law. Today, we are hearing a lot of discussion about sexual harassment through the #metoo movement. Prominent men in all walks of professional life, including the law, have been forced out of positions of power. At the same time, many state legislatures have been adopting pay equity statutes to prevent women from being being subjected to wage discrimination. But are women advancing into leadership roles in the legal profession? If 50% of law school graduates are women, why aren’t we getting close to seeing 50% women in the partnership ranks of top law firms? What are the barriers to women achieving partnership and if you are a young associate, what can you do to overcome some of those hurdles? My guest, Lauren Rikleen, has been thinking about these issues for three decades. In this episode, Lauren shares some great advice for women who are looking to advance into leadership ranks in the legal profession. While men can also benefit from her wisdom, today’s conversation is focused on helping women to find ways to move up in private practice as well as in corporate and government legal roles. As President of the Rikleen Institute for Strategic Leadership, Lauren Rikleen speaks at conferences, retreats, and professional events, consults, and provides training programs focusing on: strengthening intergenerational relationships in the workplace; women’s leadership and advancement; and strategies for minimizing the impact of unconscious bias. She is author of Ladder Down: Success Strategies For Lawyers From Women Who Will Be Hiring, Reviewing, And Promoting You; You Raised Us. Now Work With Us - Millennials, Career Success, and Building Strong Workplace Teams, and Ending the Gauntlet: Removing Barriers to Women’s Success in the Law. She has also authored more than 150 articles for publications around the country. 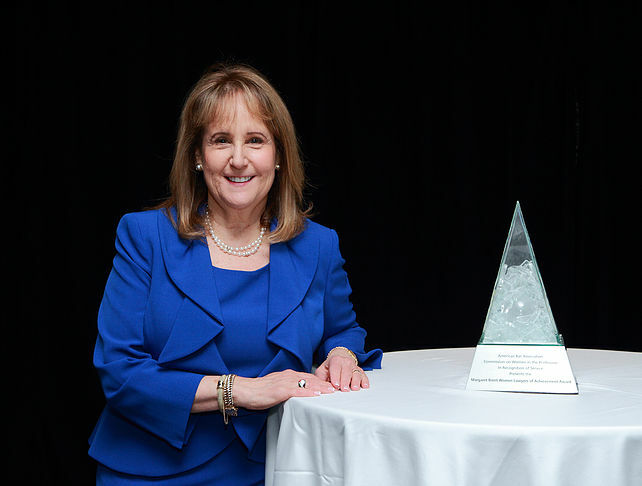 Lauren holds leadership roles in the American Bar Association and served as President of the Boston Bar Association where she established the Task Force on Professional Challenges and Family needs which produced a nationally recognized report on the costs of work-life imbalance in the law. Lauren spent over 20 years as an environmental lawyer in private practice and when I first met her in the early 1990’s, she was an active speaker at Massachusetts Continuing Legal Education where I worked as a program attorney. I also had the privilege of serving with her on the Boston Bar Association’s Standing Committee on Work Life balance more than 15 years ago. She is someone who truly cares about workplace diversity and someone who has spent a tremendous amount of time thinking about ways to change the status quo in the law. Please visit Lauren's website for more information about how to obtain her books and other publications.